Designed by Gordon Guillaumier, BRICK represents a new important project for RODA: an original and elegant inspiration expressed through a timeless design strongly characterized by the expertise of RODA in the production of teak furniture. With the BRICK table RODA discovers, once again, that even with a simple and natural material such as wood it is possible to “make technology”. 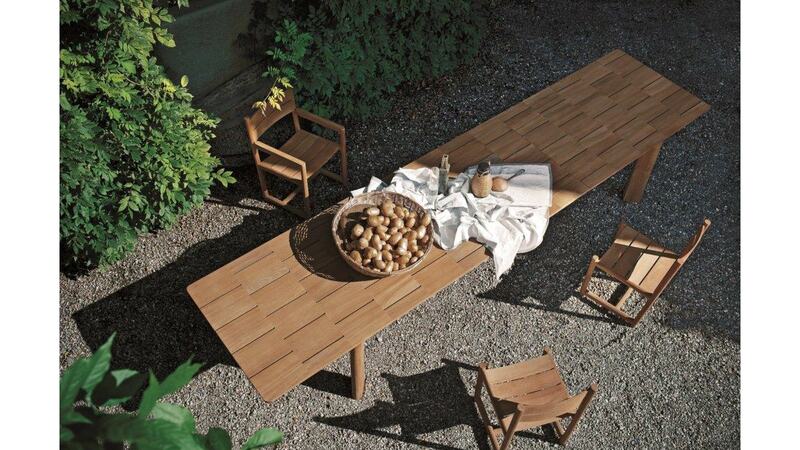 The concept of the new extendable table BRICK is already declared in its name: the valuable teak, in all its magnificence, breaks down into an original rhythmic game of joints, geometrically perfect it draws the top. The dynamism of the extension is balanced by the stable structure. BRICK is the perfect solution for furnishing wide outdoor areas. Its generous dimensions (300/420) or (180/240) create room for conviviality, thanks to the practical butterfly opening system, which hides the functional extensions under the top. BRICK is available as a round table as well as an extendable table. The BRICK extendable table is available in two lengths: 180/240 cm and 300/420cm. The round table is available with a diameter of 180cm. Click here for 001 extendable table product specifications. Click here for 002 extendable table product specifications. Click here for 003 extendable table product specifications.